The Three Rs: Rants, Raves and (Occasional) Reflections: Where Do We Go from Here and How Do We Get There? 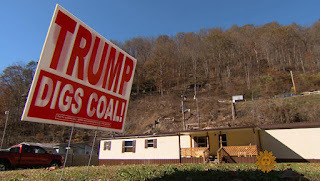 I watched a segment on CBS Sunday Morning, a story about a county in West Virginia that went to Trump by a 4-1 majority in Tuesday's election. The people interviewed were not the "deplorable" Trump supporters that Hillary Clinton referred to, but a group of blue-collar people desperate to save their town and their livelihood. Most of the residents are coal miners. Three of the county's seven mines have been shut down. The population of McDowell County has decreased dramatically in recent years, as residents went elsewhere to find work. Like most of us, they demanded change from our elected officials. The Democrats failed to give us that change. The use of fossil fuel is going the way of the dinosaurs from which it was created and cleaner sources of energy are replacing it, necessary if our planet is to survive--but I feel for these people. They can only think of the survival of themselves and their families. That's human nature. I care about the environment and the economy. Those things are important to our future. But my priorities right now are the things most important to me: Social Security and Affordable Healthcare. Both of these things are on the Republican chopping block. I'm 63 years old. I chose to take Social Security early because frankly, I don't think it's going to be around when I'm 70 or even 65, if the Republicans have their way. I've advised my son, who's now 37, to make other advance arrangements for his retirement when the time comes. I wonder how long I'll be able to get those monthly checks, how much I'll get back of the money I paid into it. As for health care, the Affordable Care Act has been a godsend. It's by no means perfect, but it's enabled me to see doctors when I need to, to get the medications I need--and there are a large number of them. I take twelve pills each day. I'm epileptic. I have high blood pressure and high cholesterol. Low thyroid. Arthritis. Glaucoma. Sometimes I think the list of problems I don't have is shorter than the list of everything that's wrong with me. For the past 31 years, I've been a professional writer, a novelist--which means I'm self-employed. Before that, I worked for a major advertising agency, where I had excellent insurance, provided by my employer. I should have bought health insurance when I sold my first novel--I was making good enough money to do so. But making good money was my excuse, in a way. I just paid cash when I went to the doctor or picked up prescriptions. That was fine--at first. But chronic illness can and does wipe out one's bank accounts. My mother was diabetic and had multiple strokes. She was totally disabled and dependent upon my son and me. After my father's unexpected passing--a massive heart attack following surgery--I had an emotional meltdown, For years, I couldn't write. Eventually, the income from my books dried up, for the most part. I ended up broke and unable to keep taking all of those meds. That took a toll. These days, my eyesight is so poor, I can't read well. My concentration is better on some days than others. And arthritis makes it difficult for me to write or to even use the computer without speech recognition software. The Affordable Care Act enabled me to get treatment for those pre-existing conditions. It's enabled me to see my doctor regularly, to get my meds and tests when needed. 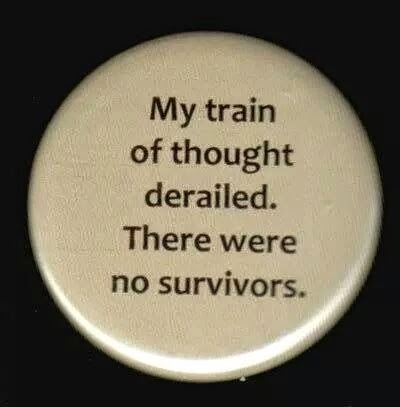 I had a CT scan a few months ago. Because of my insurance coverage, it only cost $49. Without coverage, I would not have had the test. When I hear people saying they're sick of "free" this and "affordable" that, it angers me. Anyone can end up in a desperate situation. Anyone. People on welfare, people who depend on services like food stamps or affordable healthcare are not just lazy, not all drug-addicted or mentally ill. They're mostly working class people who can't get a job that pays a living wage, people who have been laid off their jobs, people who are trying but still not making ends meet. Or people like me, who made good money but bad decisions. There but for the grace of God go you. Think about that when you're tempted to judge. The irony is the people who gleefully voted for him are going to be the ones most badly hurt by him. Hope for the best but be prepared for the worst. i am glad Obamacare was there for you. If they send it to the chopping block a lot of people will be hurt. They will, indeed. It needs a lot of tweaks--my doctor told me she has a problem doing referrals because she has no way of knowing which doctors are in-network. I agree with so much you have said. My Daughter is on Obama care and it has not really been good for her. She sees a new doctor every visit, her visits are cancelled and she has to wait longer times between visits. They keep giving her meds that make her sick and when she calls about it it is a month wait. But if she was a illegal hispanic teen with a baby she would get in right away. Or at least in California and Arizona. I want my taxes to go for the truly needy and not just someone who will get money from the PC Liberals. Illegal Hispanic anchor babies = votes for the DNC. It may take a village to raise a child but it also takes RESPONSIBLE PARENTS who what the child, not just a way to make PC liberals cry and give them money for votes. Just think all that welfare monies could be spent on citizens in true need, Retired, LEGAL Immigrants, Veterans, Older Citizens who have lost jobs to downsizing or outsourcing to Mexico and India. It is getting so I want to move to Montana or Idaho live in the mountain pay np taxes and live off the land. And I did not vote for Billary or Trump. As far as Obamacare goes, I think it depends on which plan you take. Collin signed us up. He got us a great plan that covers just about everything (he understands all that stuff much better than I do). I have a wonderful internist who has me come in more than I'd actually like to! But she's a wonderful doctor and I can email her when I have a question. I hear plans are different in each state. What you're saying here is what so many people are feeling--and why, I believe, the Dems lost the White House. They feel abandoned by their own party. Both parties have a lot of changes to make, bit so far, neither seems willing to accept that they're a bunch of screw-ups. Give this Lady a Gold Star ! Both parties messed up big time and look where we are. I came here from William's facebook feed. I wish you well. It sounds like the president-elect is already backtracking on many things including the Affordable Care Act. It's good to write about things like this. People need to call their elected reps and say how important affordable health care is to them. I'm skeptical but am willing to take a wait-and-see position--for now. You're right about making our voices heard. I have a good friend who asked to pass this post along to a group here, Missouri Healthcare for All. They're fighting to save our coverage. Trump is going about the business of getting his staff together. For the next couple months, nothing getting reported regarding policy means much. It seems that every time republicans have majorities in Congress some people assume that things like SS and disability and welfare will vanish. It never does. I'd like to see changes though. One of the things GW Bush tried to do was give people the option of handling at least part of their SS accounts themselves. The caterwauling from the left drowned out the details. All people heard was the inaccurate, "he's taking away SS!" "the elderly will be eating dog food! "disabled people will die in the streets!" Thus, those empowering ideas for improvements were never even discussed. Will Trump have some good ideas? Maybe. We'll never know if we don't give him a listen. At this point, I'm in wait and see mode. I'm not criticizing because he's Republican. I've voted for many Republicans. I don't vote by party, I vote for who I think is best for the job. My issue is with the man himself. I'm willing to take a wait and see position, but I wouldn't put money on him--and I've played a few long shots. Norma what is the difference between the Affordable Care Act and Obamacare? No difference. ACA (Affordable Care Act) is the official title. "Obamacare" is a nickname, which I believe originated in the media here. I think it's a brilliant idea. Everyone should be able to get health care, whatever their situation. Here the government scheme is called Medicare, it works really well for everyone, especially if they can't afford private cover. I think the idea was a good one. But mine sky-rocketed to over $600/mo. I said, that's it we can't afford this. My husband's work is seasonal. He is not going to get a paycheck. And since Mr. T. says he's going to do away with it, I haven't even bothered looking into anything (I get emails or calls every day about renewing), because if it'snot there, why would I bother getting tied into it to begin with. I'm glad that it was there for you, and others, Norma. We haven't needed it (knocking on wood), and just hope that something happens after Trump has his way and people realize this wasn't such a good idea after all. However, that being said, maybe he will save something for those in need. I really don't understand why this country is so backward when it comes to health care. It's really shameful! I've heard from others who have had trouble with the premiums as well. We did pretty well. I think mine is currently $130/month or something like that. I heard (on the news) that there was a sharp rise in applications on the ACA website the day after the election. And you're right, our healthcare is horrible compared to that of other countries. Collin now has full coverage through his employer--everything, including pet insurance. And he works at home, so he's very happy.